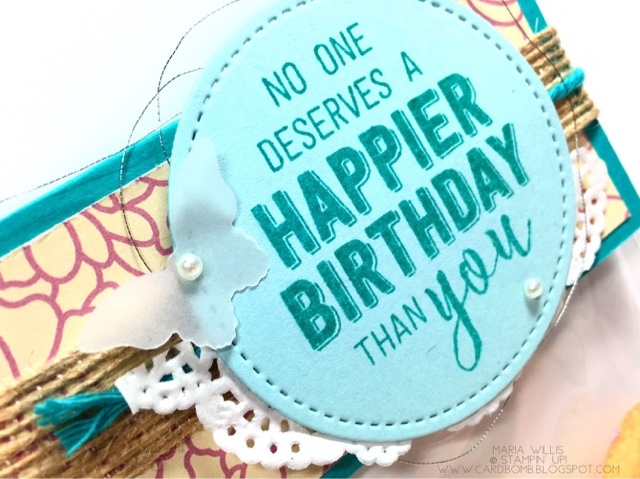 Cardbomb: OSAT Blog Hop- Birthday Bash! OSAT Blog Hop- Birthday Bash! Hey everybody! Happy Thursday and welcome to this month's One Stamp At a Time Blog Hop. This month our them is Birthday Bash and I hope you'll join us to see all of the creative birthday ideas this crew has to share. I'm loving the theme this month because my birthday is only a couple of days away and I'm looking forward to it! For my card this month I decided to use the Bokeh Technique and to give you a quick tutorial just in case you've never tried it before. 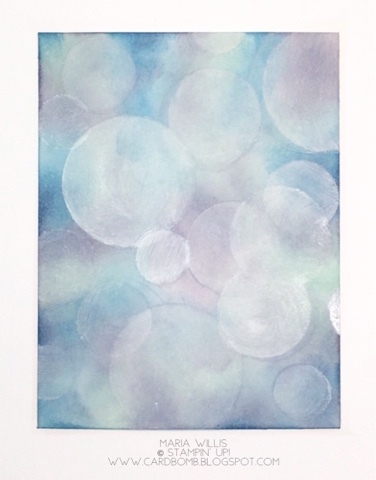 First, use sponge daubers to blend Soft Sky, Marina Mist and Wisteria Wonder inks onto your background. Start with the lightest color first. 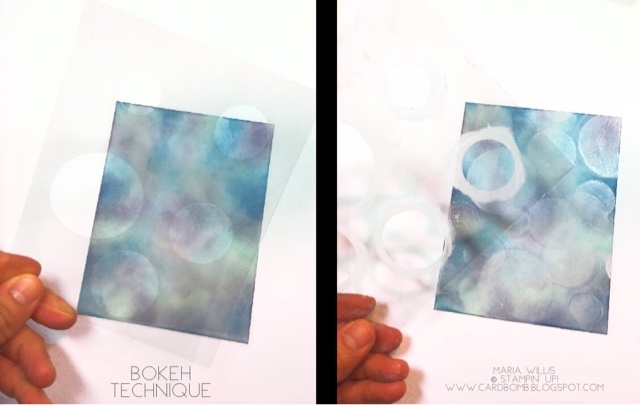 Next, use either circle framelits or circle punches in a variety of sizes to cut circles in a piece of window sheet. Using a sponge dauber gently sponge White Craft ink onto your sponged background using the window sheet as a mask. Sponge circles all over the background and overlap some circles too! Make sure not to cover the entire background as you do want color peeking through. Set it aside to let the ink dry... This is more or less what your background should look like (feel free to use different colors). 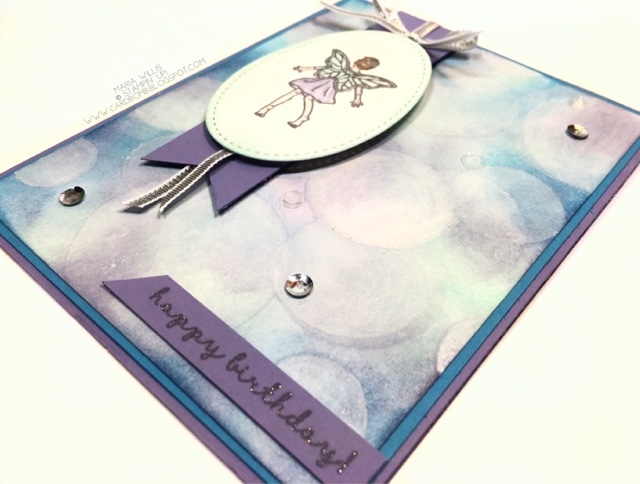 Stamp your fairy image in Basic Gray Archival onto Whisper White. Cut it out with the Stitched Oval Framelit. 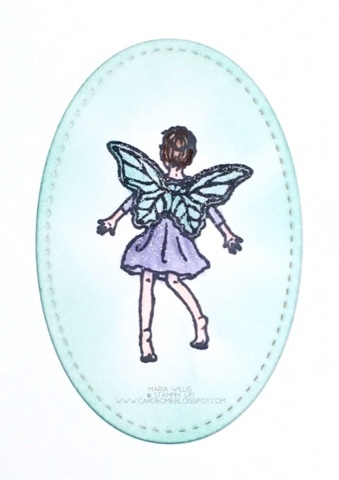 Use a sponge dauber to blend Soft Sky ink onto the background of the image.Use the Watercolor pencils to color the fairy’s hair and skin (Calypso Coral is perfect for a skin tone!) then use an Aquapainter to blend it. Use your Aquapainter and Wisteria Wonder ink to color the dress. Be careful not to use too much water. Use clear Wink of Stella to add fairy dust to the fairy’s wings and dress. Adhere your Bokeh background to the Marina Mist card face and then attach those pieces to the card face. Optionally, you can add Clear Wink of Stella to some of your Bokeh circles (I did). Add your flagged banner and silver ribbon. Then add your image piece with dimensionals. Stamp the sentiment on a scrap of Wisteria Wonder and add it to the bottom corner. To finish up your card add sequins in silver and clear using mini glue dots. My project this month is inspired by the generosity of one of my clients. 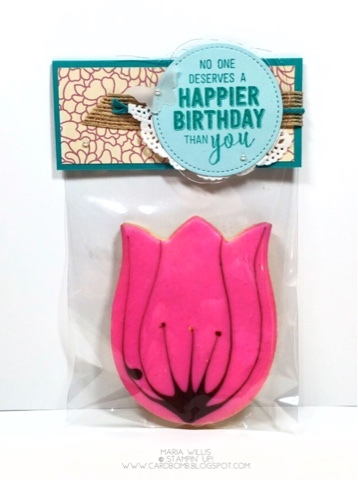 Yesterday when he arrived for his appointment with me, one of my clients presented me with a beautiful tulip cookie! It was originally wrapped in a wax paper type bag that didn't allow you to see how beautiful the cookie was. I decided that I would wrap it back up in a way that it could show off a little. I used a clear envelope to put the cookie in and decorated it with a fun birthday topper. Isn't that a beautiful cookie?! I just love the sentiment too! Thanks for stopping by my blog today. I hope you'll keep on hopping along with the OSAT hop to see all of the other fabulous birthday creations! Next up on the hop is the talented Renee Ondrajka! Just click the Next button to head her way. Maria Willis: You are HERE! Need more stamps now? Never fear! I've got you covered! Don't forget that during Sale-a-Bration (now) for every $50 USD you spend before taxes you will get to select a FREE item from the SAB catalog! If you are looking for the ultimate Stampin' Starter kit then now is the time! For $99 you will get to pick $125 in products of your choice plus any two stamp sets from the Main or Occasions Catalog! It really doesn't get better than that! Let me know if you have any questions! Lovely projects! Thanks for the technique reminder! So simple and easy to do with gorgeous results! Maria, gorgeous Bokeh card with the fairy. The bag with a topper is awesome. Great projects and you ROCKED the Birthday Bash. What a gorgeous cookie! The package totally makes it even sweeter! Thanks for sharing these great projects. What a great job you did on your Bokeh.. just gorgeous. Your fairy was perfect with the Bokeh background too! Love the bag topper as well. Awesome projects! Gorgeous bokeh background on your card! And, what a pretty way to deliver a cookie. Hi Maria, Today is the first day that I have ever seen your blog. The bokeh background is absolutely stunning! WOW! I am new to stamping and I have never seen any card so beautiful. Thanks for sharing that technique. Thank you for such a kind compliment! I'm glad you liked my card and I hope the tutorial helps you to make one of your own. Stay tuned for more technique tutorials in the near future. Let me know if you have any questions at all! Stunning and beautiful. I lik the card, it is really so beautiful. Graet thanks for sharing tutorial with us. I will definitely try to make a card for my friends birthday. I just found this tutorial. Thank you for the detailed instructions and photos.